We continue with our quest for a better understanding of the jargons used during purchase of apartments. One other confusing scenario arises when the builders/sellers mention the area of the apartments. The area in SQFT which the (Chennai) builders mention is usually the Super Built-up Area, which is much higher than the actual area you get to use within the apartment. The actual area which a person can use within the apartment, excluding area taken up by the walls is called the Carpet Area. 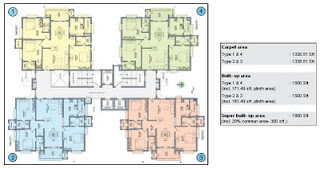 These terms are explained in this FAQ : "What is Carpet Area, Built-up Area/Plinth Area and Super Built-up Area ?" Also refer to our Complete set of FAQ related to buying an apartment.